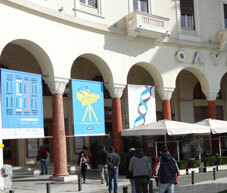 It was my second trip to Greece and Thessaloniki Film Festival. I had promised myself to go to each Festival only once. 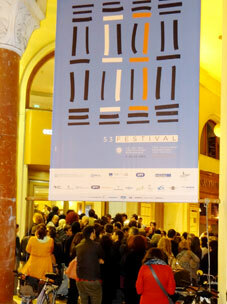 But when Thessaloniki, the most important Film Festival in east of Europe, undeterred by all the economical problems that Greece is entangled with, is held this year as usual and as organized as ever. That’s why I decided to forget about my vow and go to Greece! That surprised everybody, when I told them that I’m going to Thessaloniki again. Protests and street demonstrations and economical crisis is perhaps in contrast with holding a Festival, but a Film Festival that’s in its fifty-third edition, is a serious business and the show must go on anyway, anyhow. This edition had an essential difference with that of 2008. That year, Theodore Angelopoulos was present with his new film The Dust of Time, and I can’t forget his smile during his press conference. The happy face of kind and sympathetic Greek people was personified and reflected in his smile. In Thessaloniki, just after getting off the plane you’d love to go to watch movies! I say that seriously, and I don’t know if this has anything to do with the city being a cultural and university center or the presence of young directors and their first or second film and the opportunity to discover the young talents. You must try to experience it for yourself! I know of some people who are coming here for 15-20 consecutive years and at this time of the year the only appointment in their agenda is going to Thessaloniki Film Festival! 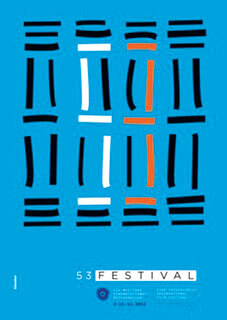 The first thing about this year’s Festival is its strange poster, which everybody wonders about its meaning and everybody has his own interpretation of. It seems it shows a passageway through its 53 edition. Well, that was my interpretation, what’s yours? As usual, the Festival was organized in a variety of sections, with 180 films, and some tributes, including for Angelopoulos, Aki Korimako, Christian Mungiu,… and a film market full of buyers and sellers. (Festival’s Director)and the mayor of Thessaloniki. For me, the record of the shortest opening ceremony so far belongs to this year. That’s the best way to do things; after all, the most important aspect of a Film Festival is its films. The Festival’s opening film was Holy Motors (Leo Carax), co-produced by France and Germany, praised during its showing at Cannes Film Festival. This year, you could watch once more, the films simply and comfortably. The movie theatres were in proximity of each other and in close distance of the hotels and The Festival’s venue. You could watch every film you like and if you’ve missed some, you could watch them at film market: as simple as that. What more did you want?! Perhaps one could expect them to show the films in your room, just in case! During the Festival, time and again the thought of Iranian filmmakers, Reza Mirkarimi and Reza Kahani came to my mind. Their films As Simple as That and Over There were greeted warmly here two years ago. When the first film in competition section gives the impression that it will probably be among the winners, it gives you enough energy to watch the rest for another ten days. Our Little Differences (Sylie Michel) is made by the only female film director present at the Festival. This German production, contrary to its title, talks about many differences and difficulties the immigrants face in their new environment. The daughter of a housemaid disappears in her absence and the mother, takes the owner of the house as being responsible. In her search, (that shows the woman as a representative of the immigrants’ community,) we find her to be in love. A one sided love that doesn’t cure her pain. The end of the film, in some way, underlies this loss and disorientation. In the beautiful ending sequence, we find out that the girl is not in fact missing but living in a big city and lost and disoriented as her mother. Boy Eating the Bird’s Food (Ektoras Ligizos, Greece) was one of the most impressive films of the Festival. 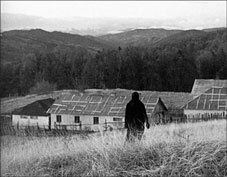 The film is the bitter story of a young man who has nothing to eat and to stay alive, eats his bird’s food. He can’t steal; and goes to a church for confession and at last his refuge becomes the same girl whom he couldn’t steal from. It seems that the film is a cautionary tale about what’s happening now in Greece and the fact that to stop the catastrophe, the Greeks must be vigilant to those economical austerity measures that are imposed on them. But the film has a major flaw. It seems that everybody around him has a good life and the only needy person is this young man. The man’s view of the people, who are in the same situation as he, could reinforce the impact of the film’s theme and given more impetus to its critical approach. Mold (Ali Ayden, Turkey) shows the persistence of some filmmakers in making boring films with their slow pace sequences. In one of the scenes, the director apparently had even forgotten to turn the camera off! It seems that even the Festivals audiences have no liking for these kinds of films. These are the films that formally and structurally have nothing more to say and don’t satisfy the audiences that are looking for new works and ideas. A train station employee is waiting for some news about his son’s disappearance, but they give back his dead body instead. A repetitious story lacking the usual subtlety of this kind of cinema. During special screening for the press, leaving the theatre in the middle of the films seems natural, but when I was watching films with ordinary people, I didn’t see anybody leaving the theatre. That was bizarre; everybody watched all the films from the beginning to the end! So I forced myself to forget about my forty minutes vow and in respect to other people I watched the films in their entirety. One aspect of some of the films in competition section was their long opening sequences! In A Month in Thailand (Paul Neguesco, Romania), even after one hour, nothing happens. 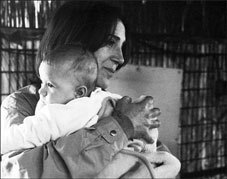 Joy (Ilias Yannakakis, Greece), a bitter, black and white film is about a woman accused of kidnapping a child and imprisoned. Despite being thought provoking, its first part is long and tiresome. Aqui Y Alla (Antonio Mendez Esparza), an American, Spanish, Mexican production, the digressions continue till the end. But unfortunately I couldn’t stand up and leave the theatre. A father, who’s been working in a foreign country, returns home. This time he’s resolute to stay with his family, but at the end he can’t manage and is forced to leave. But even that long digression doesn’t justify his departure and the audience, is puzzled, just as his family. Its only interesting parts are some of the scenes that show the warm relationship of the father with his wife and two daughters. 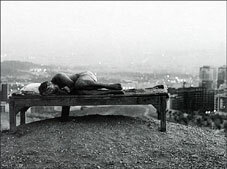 The performances are good and sometimes one could feel the influence of the cinema of Kiarostami. Taboor (Vahid Vakilifard, Iran) Vakilifard’s second film was shown in competition section. It is a successful experimental film with a remarkable direction. Despite its seemingly non linear story, the audience follows the film easily. Taboor, meaning the navel of the Earth, is the story of an insecticide man who works in homes and workshops. He has isolated his home and himself with foils to protect against filth and contamination. This is a slice of the life of some people who, we forget who they are and where they live. Just like Taboor’s character who in the end, we don’t know if he’s asleep or dead. The film taps in our conscious and force us to look at what we’ve done with environment. It’s a film that of course must be seen with the director in proximity to explain some of its sequences! The filmmaker together with his brilliant cinematographer was present at the Festival. Nasrin Mirshab, the person responsible for international distribution of the film told us: “Iranian cinema is still interesting and the audience is curious to watch its young director’s works.” This film won the achievement award at the end. Another Iranian film, Parviz, was screened in one of the important sections of the Festival, Open Horizons. Majid Barzegar is known for his interesting film, Monsoon Season and his latest Parviz shows him as a successful filmmaker. The film, just like the Monsoon Season, has a bitter story that happens in a little community. Tale of a trusted 55 year old man still living with his father, whose life changes drastically when his father remarries. That entire protective edifice suddenly crumbles. He’s forced to leave the house and the neighbors too don’t trust him anymore. Now he finds himself lonely and more than ever ridiculed by his co-workers because of his bulky physique. So he decides to take revenge from his new landlord, his former employer, the children, the animals! The film has one of the strangest and unexpected ending in Iranian cinema. It seems as though the story of these people and their actions has no ending. The acting of Lon Haftvan as Parviz is striking and extraordinarily believable. Like Someone in Love (Abbas Kiarostam) is screened in this section too. To like or not, to prefer it to his former film or not, it’s a matter of taste. But the fact that Kiarostami’s cinema is re-directed to a fiction and linear style of cinema and using all of his skills in mise en scene is an auspicious event. It’s in this field that he can fascinate his followers, not with a strange experiment like Shirin. It’s beautiful to look for love in every aspect of that old Japanese man’s life. The humanist element of Kiarostami’s cinema is recognizable even in North Pole! The old man is himself and the girl is the same cinema that he’s seeking refuge to. It’s a cinema that, like the old man protecting power for the girl, is impregnable and invincible. The presence of Kiarostami, as an eternal lover, is such a great joy for the lovers of the world cinema. Costa Gavras’s new opus, Capital is not really a remarkable film. It’s about a young bank director who replaces the former and after some vicissitudes makes the bank prosperous. Of course the film has its appealing and uplifting moments, but we expect more of a director like Gavras. In fact if he was not sitting just in front of me, I would’ve left the theatre after 40 minutes! Even during Festivals one must expect to see many mediocre films with run of the mill subjects. This has to do with the state of the contemporary cinema in general which produces only a handful good film every year. Student (Darzhan Omirbayof, Kazakhstan), is one of those aforementioned films screened in Open Horizons section. A young man kills a shop owner, steals his money and falls in love with a girl. At the end as he wants to be redeemed, he gives himself up. What are his motives to kill the man and what convincing reason pushes him to commit that crime, is not clear. On the other hand, a faulty screenplay and a shaky structure, sometimes gives the impression that all of those killings and loves were running down in his dreams, but at the end it becomes clear that we were wrong and all were really happening! 11 Meeting With My Father (Nikos Cornilio, Greece) is the story of a girl meeting her father after years of separation. The father had left her and her mother years ago and knows nothing about them. When the girl can’t communicate with her father, she decides to leave the country. The painful ending is one of the distinctive aspects of this very slow paced film. But, it tries to be faithful on real flow of events, and doesn’t try to artificially provoke the audience sentiments as the similar kind of films do. I don’t know why the most important events of a Festival happen in its last days. So what will happen if someone leaves town in the middle of the Festival! This time the real event was meeting Romanian filmmaker Christian Mungiu and watching his new film, Beyond the Hills. Mungiu with his usual shyness and pleasing face participates at the press conference and fully answers the questions with courtesy. He says: “I like multi-layered and composite stories. During the making of the film my only concern was believability of the scenes. I try to re-enact the moments of life. If that happens correctly, the film would be successful and valuable.” And Beyond the Hills has really succeeded to reach that goal. An engaging cinematic work, with a beautiful art direction, which at the same time is faithful to its literary source. Although the 150 minutes film doesn’t feel long, but Mungiu could make some of the chapters shorter! Of course there is so much good acting and unforgettable sequences that it seems the filmmaker couldn’t pass on them. In the first, when the girl meets her friend at train station, and her relentless crying in the midst of the strange noises of the train, predicts a tumultuous future for her. And at the end when the police car picks up the priest and the rest for interrogation about the girl’s death, the camera stops in the middle of the snowy street. As if even the filmmaker doesn’t know what is right or wrong and is doubtful about film’s resolution.